Crazy to think it's been 11 years with this amazing man! What a happy little world we've created ❤ here's to many more years to come! Hope all is well in your various worlds! Today we’re taking a moment to talk about Animal Crossing. Now that you can play on their mobile app I’ve been noticing that people have been talking about it more. I absolutely adore Animal Crossing but I don’t actually have the mobile game. Why? 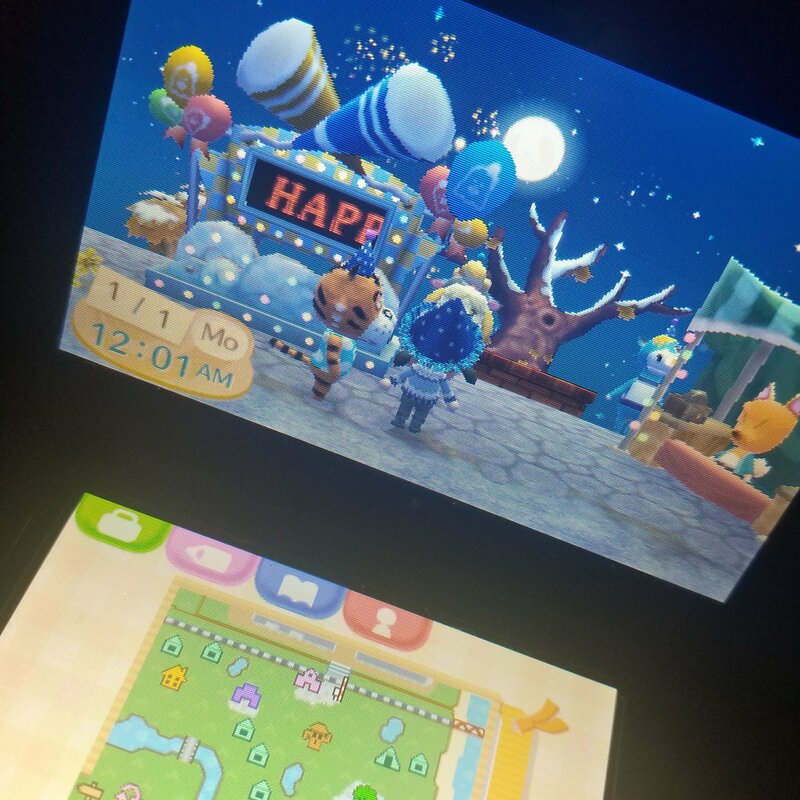 Because I’m still obsessed with playing New Leaf on my 3DS! Animal Crossing New Leaf cane out in 2013… almost five years ago and I’m still in it! If you are unfamiliar with this game the premise is pretty simple. You start the game as a newly elected mayor of the town. The objective is basically to create a town that citizens are happy with and to become friends with citizens. You do this by raising money to add new things to your town and by helping the townspeople with their problems and chatting with them. For money you can sell stuff, collect fruit, play on the turnip stock market, and other stuff. You can also expand the museum buy collection paintings, fish, and bugs which can be sold for a profit if you so choose. Celebrate the holidays with the townspeople! While you’re not running around helping townspeople and expanding the town you can work on renovations and designs for your house. You can also switch up your clothes, makeup, hair, and stuff like that. This game isn’t really a thinking game. You’re not solving puzzles or attempting to take down a big boss. Everything is simple and that right there is the beauty of it all! Sometimes I want to just kick back and not think. Sometimes I want to play a game where my biggest problem is that I can’t find a wharf roach for a citizen that wants it as a pet. Sometimes I don’t want to have to do crazy missions just so I can get new armor. Instead I want to shake a tree for a few apples that I can sell on the spot and go pick up new furniture, clothes, or whatever I want! I think that’s why this game is still kicking at least for me that’s why and I’d wager a few other people feel the same. It’s the perfect stress free game! 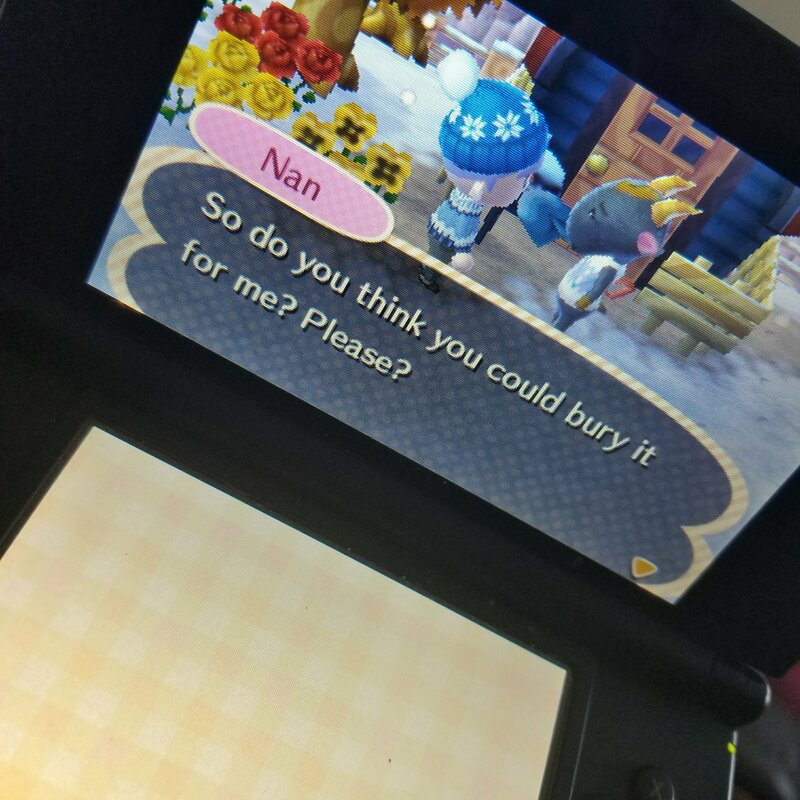 Trust me nobody is rage quitting New Leaf. Not only is it a chill game but you can sink a lot of time into it. There’s always something to do. New renovations, friends, or other things to work on. It’s one of those games that you never really complete. You can always pick it back up and mess about. All I have to do is bury something? Consider this mission complete. So while I’m sure the mobile game is swell, you won’t take me away from my 3DS. On top of that you can bet your bottom dollar that if they come out with another Animal Crossing I’ll have that swooped up so fast! As a final thought I’d like to say that sometimes I feel like games like this aren’t given enough credit. I can’t count the number of people who have said stuff like, “That’s a kid’s game.” As they roll their eyes. It’s rated E for Everyone for a reason! Because everyone can have a fun time playing. I sure do! I’m not going to pretend for a minute that I don’t! So if you’re still playing good on you ❤ and if you’ve never tried it why don’t you give it a shot! *These images were taken by me as I played Animal Crossing New Leaf. I do not own the images represented. I’m the same way! My husband plays animal crossing on his phone as it seems fun but I think I would still prefer it on the DS. I think you’d really enjoy the game if you had the opportunity to play it. I’m told is also like Harvest Moon (if I recall the gene title right) so one day I might try that out. I Haven’t picked up animal crossing beyond the phone game (which I love!). It’s one of those games that I just haven’t ventured into yet. There’s no reason behind that, really. It seems like a game I’d adore if I started it. I love stress free games. Harvest Moon is one of my favorite titles, after all, and it’s fairly stress free as well. I buy every other title from the series! It was fun reading about your love of Animal Crossing. I have been told I should check out harvest moon! I’ve had to add it to my list of games to check out. My husband had it on his phone and he really likes it but I think there are def some pros of having it in the DS instead from what he tells me. One of these days I’m going to have to check out Harvest Moon and I have a good feeling I’m going to love it. PreviousHave You Heard of Maple Holistics?